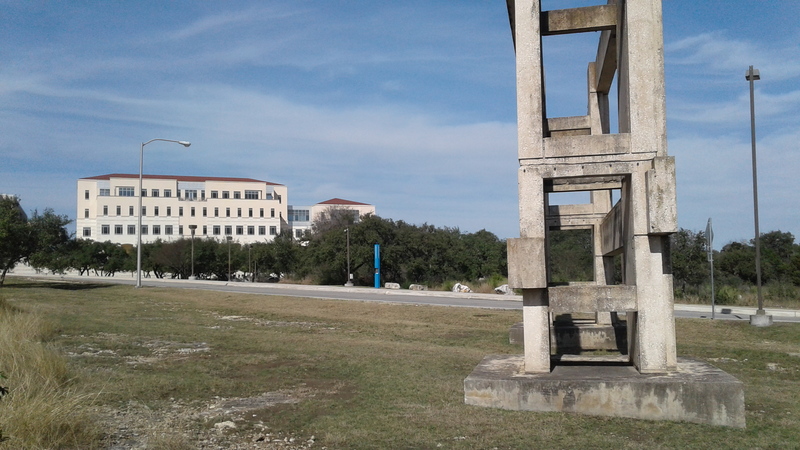 A peculiar structure sits atop the land on the east side of UTSA’s main campus, about west of Bauerle Road near Key Circle and the Music Building. Perhaps you have seen this behemoth concrete mass standing alone. Have you walked by it and simply ignored, or like me, vaguely wondered about its purpose? 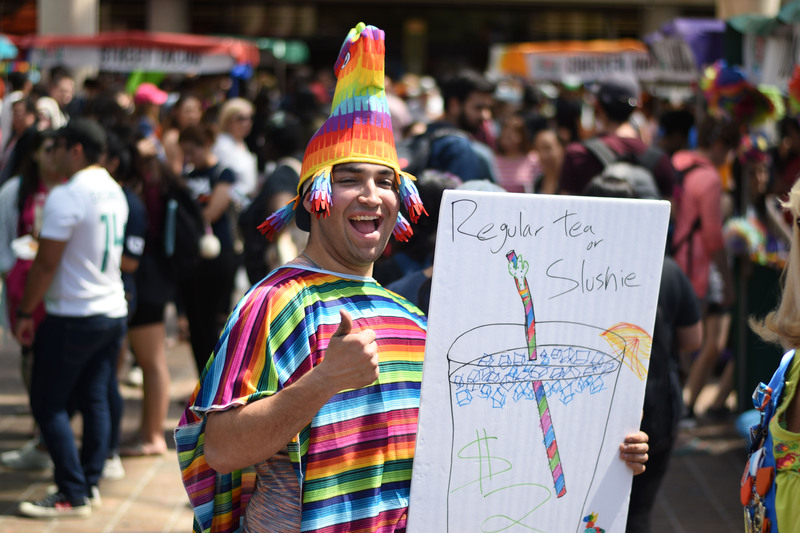 My arts editor offered me this story and a chance to investigate the stonehenge, UTSA’s ancient relic, which I pounced on. When I asked a few students about their thoughts on this fragmentary construction while lingering around the beige and shabby object, they shrugged, ignored me or looked at me funny. How was I the mad one? This alien structure stands among us, and no one thinks to ask about it? I walked into the music and arts building to see if any professors knew, but I only found empty halls and voided rooms. Had the structure taken them? Nevermind the lateness of the day, the whole ordeal was beginning to feel like a small section of a large chapter in a grandiose Thomas Pynchon novel. View from the side of mystery structure. If humans could not help me solve this enigma, then I would have to seek the help of the all-knowing internet. But I was only left with more questions. The all-knowing internet was not so all-knowing. Two years ago, a user named “greenhearted” created a Reddit article about UTSA’s Stonehenge, starting or continuing speculations about it being an art installation. Reddit suggested Stonehenge was perhaps part of brutalist-style architecture, designed to look rugged with a lack of comfort and general concern for anything. That is an apt description of Stonehenge. 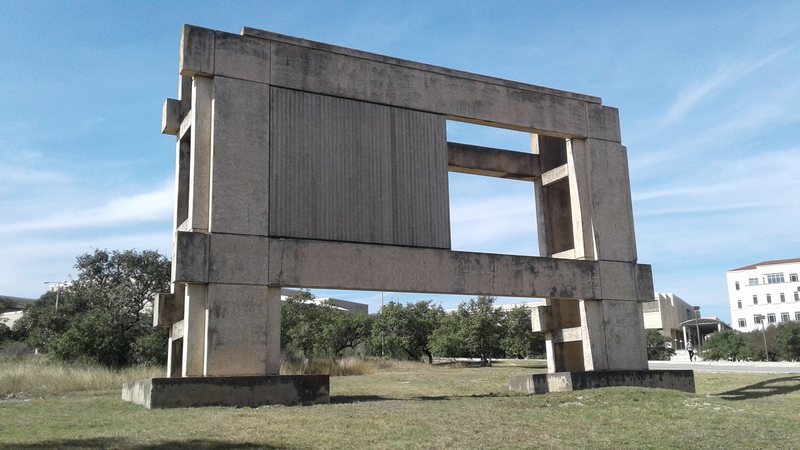 I did find an incredibly small reference to UTSA’s Stonehenge when I typed in the additional phrase “arts building.” I thought, surely, Reddit was onto something: UTSA’s Stonehenge is some architectural endeavour, perhaps, in my opinion, a love letter to the Russian Revolution and the constructivism style the revolution spawned. Maybe. Was it true? I found a blog for UTSA’s Libraries Special Collections called The Top Shelf that led me to a Spring/Summer 2015 issue of Sombrilla, page 17, confirming Bippert’s statement and O’Neil Ford’s involvement. James Pinkard, former UTSA student, wrote in the 1997 publication of Sombrilla that Stonehenge was a prototype to assess what UTSA’s original seven buildings would look like, but was left standing as a reminder of UTSA’s inception. After another Google search, I found a publication called “UTSA Uncovered” in the UTSA library database. Its location is the Archival Collections at ITC Library, but it is missing. Last seen Sept. 23, 2013. I found it listed in the San Antonio library. No copies are available for checkout at this time. The plot thickened. UTSA’s blog The Top Shelf highlighted a three-volume guideline for the UTSA buildings, which requested a mock up structure. However, The Top Shelf’s research show the position for this mockup is not where our current-day Stonehenge exists, and the mockup was actually demolished later. The Top Shelf argues our Stonehenge is a second mockup for the Multidisciplinary Studies and Arts buildings, built sometime during 1978 to 1982, and it was not demolished. I could not find any corroborating evidence for this. I found nothing else. I was left only confused. I did not solve UTSA’s Stonehenge mystery. I have only found half-truths and muddled understandings. Maybe Stonehenge is an art project after all, representing our life’s pursuit of deeper knowledge, leaving us with only more questions. Are we desensitized by news?